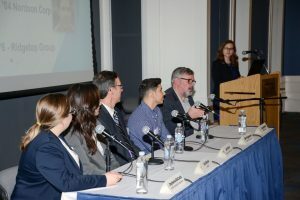 Presented by the Alumni Mentoring Program, The School of Engineering’s Spring Alumni Networking Panel and Event brought together students and alumni from all disciplines of engineering. For the students, the event is a chance to build valuable relationships with members of their prospective industries. 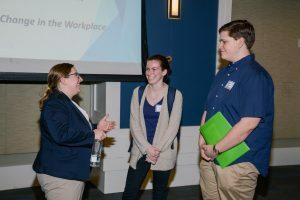 For the alumni, the event provides the opportunity to pass on their insight and knowledge to the new generation of TCNJ engineers. Many of the members of the alumni panel have participated in mentoring events for years and are currently employed at companies such as PSE&G and Teletronics Technology Corporation. This year, the set of panelists included Stephanie Decotiis, ’08, Lisa Garcia, ’09, John Hildin, ’83, Matthew Pappalardo, ’04, and Craig Wentzel, ’76. If you are a member of our alumni community and wish to participate in a mentoring event, the Fall semester event will take place on September 26th, 2018 and the Spring event will take place on February 20th, 2019.